Shuttle manufactures high-quality, functional and attractive products that provide many different options for customizing a classroom space. ShuttleZone tables are specially designed to meet the needs and opportunities of today’s changing schools. With their streamlined design, ShuttleZone Computer Tables make ideal laptop tables, but they’re also rugged enough for your heaviest equipment. Techera is the perfect instructor desk for technology-intensive learning environments like computer labs and media centers. The ShuttleZone Open Space Collection separates the traditional workspace into more manageable, technology-friendly pieces to suit today’s more fluid classrooms. 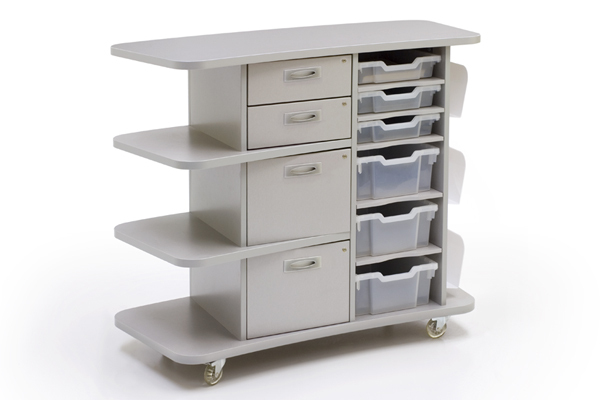 Mobile, technology-friendly desks and storage units that instantly connect with the patented pushbutton ShuttleLatch. ShuttleZone Pedestal Desks are the choice of educational professionals who need a quality, technology friendly workspace at a reasonable price. Super-tough and transportable, ShuttleZone Mobile Cabinets offer a smarter, more flexible solution for managing supplies and classroom equipment allowing storage to move easily within a room or to relocate from room to room as your needs change. Super-tough and transportable, ShuttleZone Mobile Wardrobes provide a smarter, more flexible solution for managing supplies, classroom equipment and teachers’ personal belongings. Super-tough and transportable, ShuttleZone Mobile Cabinets offer a smarter, more flexible solution for managing supplies and classroom equipment. ShuttleZone Satellite Support Modules transport supplies and materials wherever you need them. Choose from two heights; the desk height works great with our ShuttleZone Desks while the standing height doubles as a lectern. Super-tough ShuttleZoneStationary Cabinets offer a smarter, more flexible solution for managing supplies and classroom equipment. All ShuttleSystem computer workstations shall be designed to allow for maximum flexibility in designing and reconfiguring different current and future classroom configurations and shall be specifically designed to be “docked” together with all other workstations in the system. The computer workstations shall be either 25”, 28”, or 31” high. The rear 6” section of the worksurface shall serve as a wire management cavity cover. The cover shall open easily by rotating up-and-forward 90 degrees to provide access to the station’s wire management area. The cover shall remain attached to the station to prevent the cover from being misplaced. 1” deep rounded access points in the back of the wire management cavity cover shall allow power and data cables to pass through from the worksurface to the wire management cavity; the access points shall be wide enough to serve as handles to open the wire management cavity cover. Each wire management cavity cover shall be secured with two steel, European style hinges capable of pivoting 95 degrees. The wire management cavity covers shall be supported by a support brace/lock catch anchored to the back panel. An optional key-lock shall be available for the wire management cavity cover. The worksurface and wire management cavity cover shall be laminated with high-pressure laminate bonded to 1 1/8” high density particleboard. The bottom surface shall be laminated with a backer sheet as a moisture barrier. Both the worksurface and the wire management cavity cover edges shall be finished with 2mm contour banded pvc. The worksurface anchoring system shall be strong enough to support frequent lifting or rolling of the station for rearrangement and reconfiguration. The worksurface shall be anchored to the top of each side panel by an extra-strength tightening and fastening system. The fastening system shall consist of two 14 mm diameter threaded metal inserts installed in the worksurface, two 3 ¼” steel connecting bolts screwed into the inserts, and two recessed 35mm diameter zinc die-cast/steel 1080 degree tightening cams countersunk at the appropriate stress points in the side of the side panel. Wire Management Cavity Characteristics – The wire management cavity shall allow easy and frequent access to power and data. The wire management cavity shall allow for the easy separation of data and power cables, both for individual stations and for connecting stations. The wire management cavity shall be located at the rear 6” of the workstation, just under the wire management cavity cover section of the worksurface and shall be large enough to accommodate a large volume of power and data cables. The wire management cavity bottom shall be fabricated from ¼” medium density fiberboard and shall be recessed 2” from each end to allow for wires to pass though. A 1” by 1 ½” rounded plastic trunking strip shall attach to the inside of the backpanel below the support brace/lock catch; a 3” high, 1” wide Nylon cable separator tab shall attach to the upper inside of each side panel. Modesty Panel Characteristics – The modesty panel height shall be 11” and shall provide additional horizontal structural support for the main worksurface section. The modesty panel shall be anchored to the inside of each side panel in a through-bolt fashion for extra strength and extra support, using two steel 60mm joint connector bolts passing through the side panel and into two steel cross dowels installed in the modesty panel. The modesty panel shall serve as the anchoring point for two zinc die-cast/steel insert hinges capable of pivoting 95 degrees that shall also be attached to the wire management cavity cover. The modesty panel shall be fabricated of 1” thick high-density particleboard covered with smooth finish laminate on both sides and shall be finished with PVC edge banding on exposed edges. Side Panel Characteristics – The shape of each side panel shall be designed to have a matching contour in the event that glide and castered side panels are used in the same workstation configuration and so that the contours match when stations are connected. The top of the side panel that forms the inside of the wire management cavity shall have a contoured wire-pass through channel, allowing power and data cables passing between adjacent stations to be easily laid in the channel rather than having to be passed through holes in the side panel. The distance from the back of the side panel to its front edge shall be 16” at the bottom of the panel to allow for less foot interference; this depth shall increase to 20” at its top. The side panels shall be fabricated of 1” thick high-density particleboard covered with smooth finish laminate on both sides and shall be finished with 2mm contour banded pvc. The bottom of each side panel shall be anchored to a 40mm x 80mm powder-coated, 14-gauge steel foot tube using two screw/steel cross dowel connectors for extra strength. Each foot tube shall be equipped with two adjustable glides or two optional casters. The side panels shall be offset and anchored to the underside of the worksurface at the appropriate position to avoid caster interference when two stations are moved together while connected (or “docked”). Back Panel Characteristics – The back panel height shall be 16” high and shall be fabricated of 1” thick high-density particleboard covered with a smooth finish laminate on both sides. All exposed back panel edges shall be finished with 2mm contour banded pvc. The back panel shall be anchored to the side panels using 2 14 gauge angle brackets per side panel. The brackets shall be attached to the side and back panels using joint connector bolts threaded into the 5/16-18 threaded inserts installed in the panel. Located in the middle of each back panel shall be a 2-1/2” central power cable pass-through hole covered with a press-fit grommet. Docking Connection System – Each workstation shall be equipped with a large, 5″ x 2″, self-aligning, extra-strength docking connection system to accommodate the easy connection and disconnection of stations. The docking connector shall be a central feature of all workstations and shall be “teacher-friendly” and allow for instant connection and disconnection of stations without tools and without removing any parts or hardware. The docking connection system shall be self-aligning and shall consist of two mating halves – made of heavy-duty Nylon for maximum ease of connection and longevity – which allow for easy station alignment and that result in stations being snuggly adjacent when connected. The docking connection system shall also consist of a sliding, spring-controlled, latch mechanism that automatically connects two stations when they are pushed together, and easily disconnects two stations when the button-head portion of the latch is pushed forward from the front underside of the station. The button on the sliding latch shall be equipped with a locking screw to discourage unauthorized disconnection. The docking connection system shall provide equally strong docking when there is vertical misalignment between stations caused by floor unevenness – up to a plus-or-minus 5/16″ of misalignment. When workstations are under extreme force, the docking connection system shall automatically disconnect with no damage to stations or latch if docked stations are pulled apart without releasing latch mechanism. Component Connections – All connections between individual workstation components shall be made with machined, metal-to-metal hardware in order to effectively accommodate possible multiple assembly and disassembly of workstations over time. The Stationary Storage cabinet shall be ruggedly designed to withstand frequent use and shall be designed to accommodate adjustable shelves. The horizontal surfaces of the Stationary Storage cabinet shall be constructed of 1” thick, high-density particleboard laminated 2 sides with low pressure laminate. The edging shall be 2mm banded PVC. The sides, back panels and toe kick of the Stationary Storage cabinet shall be constructed of ¾” high-density particleboard, laminated 2 sides with low pressure laminate. The edging shall be 2mm PVC. All panel edges that come in contact with the floor shall also have 2mm edge band applied. The recess area at the back of the cabinet shall accommodate a full width nailer to anchor the cabinet to the wall. Two optional locking doors shall also be available. Doors are to be constructed with ¾ a high-density particleboard laminated 2 sides with low pressure laminate. The edging shall be 2mm PVC. Doors shall include recessed brushed steel pulls and cam locks. The Satellite Support Module shall be specifically designed to withstand the structural stress of frequent movement and reconfiguration and shall also be specifically designed to maximize storage capabilities and options for the teacher. It shall be designed to be consistent in look and appearance with the corresponding Open Space teacher Flux Desk. Top Surface – The top surface shall be curved at a 130″ radius to allow for a partial wrap-around feeling and shall be constructed of 1-1/8”” thick, high-density particleboard with HPL laminate on the top and a backer on the underside. The edging shall be 2mm, contour banded pvc. Base – The base shall also be curved to mirror the top surface and shall be constructed of 1″ thick particleboard, with low pressure laminate on the top and the underside. The edging shall be 2mm, contour banded pvc. There shall be (4) 3″ diameter, locking, plate-mounted casters anchored to the bottom with bolts threaded into metal inserts in the base panel. Horizontal Support Panel – There shall be a horizontal support panel, located equidistant from the top and base and located on the left half of the support module, that shall be curved to mirror the top and base surfaces. It shall provide additional structural support and shall be anchored to the adjacent vertical support panel. The left side of the horizontal panel shall serve as an additional open storage area. The horizontal support panel shall be fabricated of 1” thick, high-density particleboard with low pressure laminate on the top and the underside. The edging shall be 2mm, contour banded pvc. Vertical Support Panels – The top surface shall be supported by 3 vertical support panels constructed of 3/4″ high-density particleboard, laminated 2 sides with low pressure laminate. These vertical panels shall be anchored to the top surface using angle brackets through bolted to the side panels and bolted to metal inserts in the top surface. They shall be anchored to the bottom panel using joint connector bolts through the bottom panel into steel cross dowels in the vertical support panels. In addition, the middle vertical support panel shall be anchored to a 1″ thick, radiused, mid-horizontal support panel with 2mm pvc edging that shall extend from the middle of the station to the outside left end of the station, the portion outside the left support panel forming an extra storage shelf. Back – The back panel shall be constructed of 3/4″high-density particleboard, laminated 2 sides with low pressure laminate and shall be located behind the main section of the station, leaving open the back of the two outside sections. The back panel shall be designed to provide for additional structural integrity and shall be anchored to the bottom panel using joint connector bolts through the bottom panel into steel cross dowels in the back panel. Additionally, it shall be anchored to the vertical support panels using joint connector/steel cross dowel fasteners. Storage – The station shall have multiple optional, mixed-type storage areas. There shall be a lockable file drawer in the lower left cabinet area. Above this drawer shall be a fixed shelf creating an open storage area that can either be left open or can be equipped with an additional lockable file drawer or 2 smaller drawers. The right half cabinet area shall be designed to accommodate 18″ of clear, plastic totes – mixed and matched from 3″ and 6″ high options. The totes shall be easily removable and reconfigurable. The right end of the station shall be equipped to accommodate two optional, sequentially positioned, easily accessible, fixed PETG plastic file storage bins. (29”/42” High, 36”/48” Wide, 18” Deep). The Mobile Cubbie storage cabinet shall be ruggedly designed to easily withstand the stress of frequent movement. It shall be constructed with full-length, right angle shaped, vertical aluminum extrusions in each corner for extra rigid and durable construction. The aluminum extrusion shall be slotted, concave shaped and shall be specifically designed to both connect the perpendicular sides of the cabinet in multiple locations and also capture a multiple slotted, fully rounded convex extruded rigid PVC edge that when combined with the extruded aluminum shall provide extra protection against bumping and corner damage. The aluminum extrusion shall be anchored to the perpendicular sides in a steel to steel fashion using steel cross dowels inserted into multiple locations in the side panel. 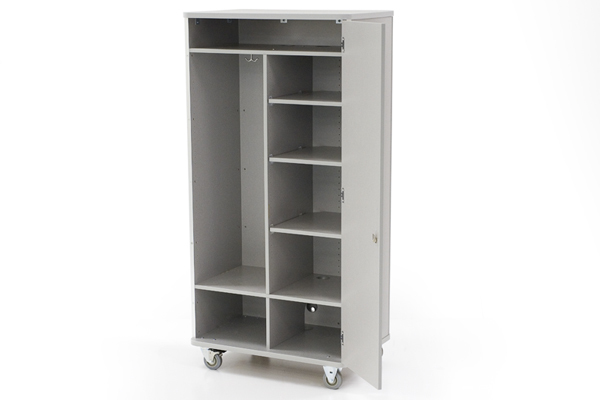 The Mobile Cubbie storage cabinet shall be designed to efficiently provide nominal 11”H x 11”W, individual student storage space, or “cubbies”. The different size cabinets shall offer a different number of cubbies – ranging from 6 to 12. Top Surface – The rectangular top surface shall be rectangular and shall be constructed of 1-1/8″ thick particleboard with HPL laminate on the top and a backer on the underside. The edging shall be 2 mm pvc contour edge banding. Base – The base shall also be curved to mirror the top surface and shall be constructed of 1″ thick particleboard, laminated 2 sides with low pressure laminate. The edging shall be 2 mm pvc contour edge banding. The base and top shall be oversized with radius corners to provide extra protection for the cabinet against bumping damage. The side and back panels of the Mobile Storage Cabinet shall be constructed of ¾” high-density particleboard, laminated 2 sides with low pressure laminate. All panels shall be connected in a metal to metal to fashion with heavy duty hardware, steel cross dowels and 14 gauge angle brackets. There shall be four locking, heavy duty, 3” casters on the 29”H cabinet and four 4”casters on the 42”H cabinet, mounted in a through-bolt fashion to the base of the cabinet. The two casters on the right side shall be non-swivel to provide for easier maneuvering and added protection against tipping. The two casters on the left shall swivel and have a braking tab that secures the wheel when activated. 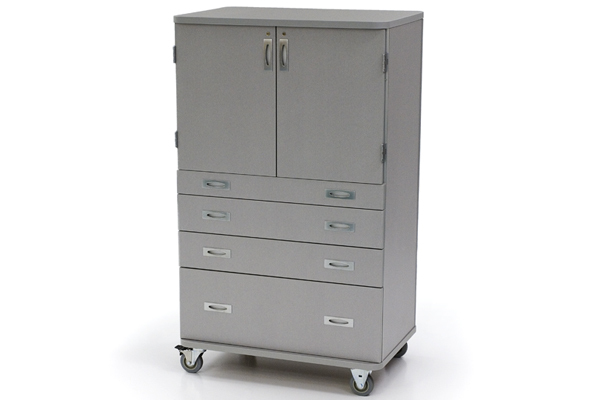 The Mobile Wardrobe storage cabinet shall be ruggedly designed to easily withstand the stress of frequent movement. It shall be constructed with full-length, right angle shaped, vertical aluminum extrusions in each corner for extra rigid and durable construction. The aluminum extrusion shall be slotted, concave shaped and shall be specifically designed to both connect the perpendicular sides of the cabinet in multiple locations and also capture a multiple slotted, fully rounded convex extruded rigid PVC edge that when combined with the extruded aluminum shall provide extra protection against bumping and corner damage. The aluminum extrusion shall be anchored to the perpendicular sides in a steel to steel fashion using steel cross dowels inserted into multiple locations in the side panel. 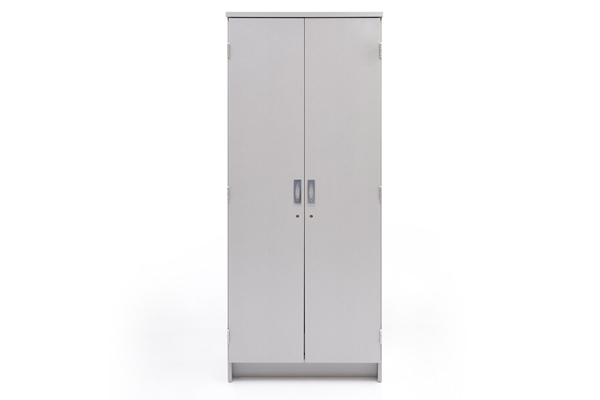 The Mobile Wardrobe storage cabinet shall be divided into two equal width sections. The left section shall be a closet section with a locking door, coat hook and a lower storage area that shall accommodate either an open shelf or a locking file drawer. The right section shall be a flexibly designed storage area with an optional locking door. The upper part of the right section shall be designed to accommodate adjustable shelves (with or without plastic totes). The lower part of the right section shall accommodate either open adjustable shelves or a locking file drawer. Drawer front is to be constructed with ¾ a high-density particleboard laminated 2 sides with low pressure laminate. The edging shall be 2mm PVC. Drawer front shall include recessed brushed steel pulls and optional locks. Construction of the drawer box shall consist of a ¼” particleboard bottom with white melamine applied on both sides. Also ¾” particleboard back panel with white melamine applied on both sides. The sides of the drawer shall be constructed of 16ga powder coated steel drawer slides. All components are attached using coarse wood screws. Doors are to be constructed with ¾ a high-density particleboard laminated 2 sides with low pressure laminate. The edging shall be 2mm PVC. Doors shall include recessed brushed steel pulls and cam locks. Top Surface – The rectangular top surface shall be rectangular and shall be constructed of 1-1/8″ thick particleboard with low pressure laminate on the top and a backer on the underside. The edging shall be 2 mm pvc contour edge banding. There shall be four heavy duty, 4” casters mounted in a through-bolt fashion to the base of the cabinet. The two casters on the right side shall be non-swivel to provide for easier maneuvering and added protection against tipping. The two casters on the left shall swivel and have a braking tab that secures the wheel when activated. (29”/36”/60”/72” High, 30’’/36”/42” Wide, 24” Deep). The Mobile Storage Cabinet shall be ruggedly designed to easily withstand the stress of frequent movement. It shall be constructed with full-length, right angle shaped, vertical aluminum extrusions in each corner for extra rigid and durable construction. The aluminum extrusion shall be slotted, concave shaped and shall be specifically designed to both connect the perpendicular sides of the cabinet in multiple locations and also capture a multiple slotted, fully rounded convex extruded rigid PVC edge that when combined with the extruded aluminum shall provide extra protection against bumping and corner damage. The aluminum extrusion shall be anchored to the perpendicular sides in a steel to steel fashion using steel cross dowels inserted into multiple locations in the side panel. There shall be four locking, heavy duty, 3” casters on the 29”H and 36”H cabinets; and four heavy duty 4”casters on the 60”H and 72”H cabinets, mounted in a through-bolt fashion to the base of the cabinet. The two casters on the right side shall be non-swivel to provide for easier maneuvering and added protection against tipping. The two casters on the left shall swivel and have a braking tab that secures the wheel when activated. 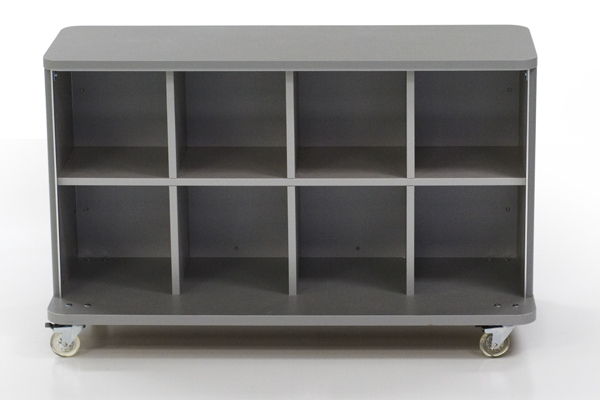 The Mobile Storage Cabinet shall be designed to accommodate a wide variety of storage option combinations, including adjustable shelves (with or without plastic totes), and/or 6” and 12” pull out drawers on heavy duty glides. Drawer front is to be constructed with ¾ a high-density particleboard laminated 2 sides with low pressure laminate. The edging shall be 2mm PVC. Drawer front shall include recessed brushed steel pulls. Construction of the drawer box shall consist of a ¾” particleboard bottom with white melamine applied on both sides. Also ¾” particleboard back panel with white melamine applied on both sides. The sides of the drawer shall be constructed of 16ga powder coated steel drawer slides. All components are attached using coarse wood screws. 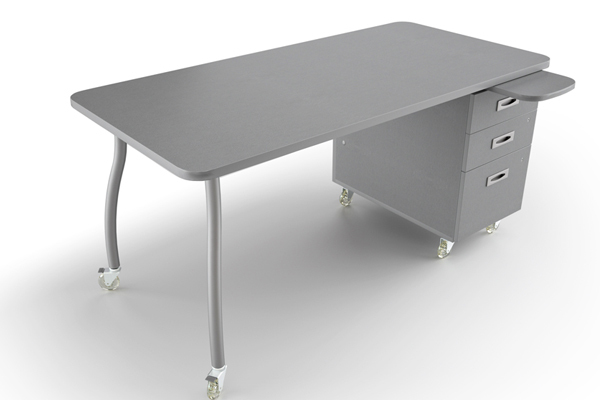 The Double Pedestal desk shall be specifically designed to withstand the structural stress of frequent movement and reconfiguration and shall also be designed to seamlessly accommodate a number of add-on options – including power/data modules, center drawers, and modesty panel or wire manager. There shall be two assembled pedestals mounted underneath the worksurface on the left and right side. Worksurface – The worksurface of the teacher conference desk shall be constructed of 1-1/8″ thick, high-density particleboard with HPL laminate on the top and a standard backer on the underside. The edging shall be 2mm contour banded PVC. There shall be 5/16-18 metal inserts in the underside of the work surface that shall be used to anchor each pedestal. Pedestal – The pedestals shall mount under the worksurface on the left and right side using 5/16-18 joint connector bolts into 5/16-18 inserts embedded into the bottom side of the worksurface. The pedestal will be constructed of 3/4” high-density particleboard, laminated 2 sides with low pressure laminate. The edging shall be 2mm PVC. 1/4-20 joint connector bolts and 1/4-20 steel cross dowels will be used to construct the pedestal panel parts. The pedestal will have the options to include large file drawers or small pencil drawers. Other options will be open shelves and a door on the opposite side of the drawers. Pedestal would include adjustable aluminum feet or 3” locking casters, mounted in a through-bolt fashion to the base of the cabinet. Each pedestal shall contain a concealed, entrapped auxiliary writing surface. This surface shall be constructed of ¾” particle board with low pressure laminate 2 sides and full perimeter edgeband of 2mm PVC. For the sake of safety, the shape of the protruding edge shall be of an elliptical shape. Construction of the pedestal shall be such that this writing surface shall extend beyond the work surface 12” in the open position, but no further. In the closed position, the auxiliary writing surface shall not extend past the work surface, but shall extend past the pedestal by 1” so that the finger groove in the bottom can be accessed and the writing surface can be deployed. Drawers – Drawer front is to be constructed with ¾ a high-density particleboard laminated 2 sides with low pressure laminate. The edging shall be 2mm PVC. Drawer front shall include recessed brushed steel pulls and optional locks. Construction of the drawer box shall consist of a ¼” particleboard bottom with white melamine applied on both sides. Also ¾” particleboard back panel with white melamine applied on both sides. The sides of the drawer shall be constructed of 16ga powder coated steel drawer slides. All components are attached using coarse wood screws. Shelves – Shelves shall be made from 3/4” high-density particleboard, laminated 2 sides with low pressure laminate. The edging shall be 2mm PVC. Shelves shall mount to the inside of the pedestal using plastic and metal quarter turn cam mechanism installed into shelf. Side panels of pedestal will use a metal shoulder screw to accept quarter turn cam. Wire Access: On each side of the pedestal shall be located one 2 ½” diameter round holes into which are inserted grommets with covers for cords and wires: each shall be positioned 2 ½” from the back edge and 1 1/2” from the top. Another grommet shall be positioned on the back of the pedestal and shall be positioned 6” from the back edge and 2” from the bottom. Optional Hard Modesty Panel – The Modesty Panel measures a minimum of 26″ long x 18″ high, and shall be made from 3/4” high-density particleboard, laminated 2 sides with low pressure laminate. The edging shall be 2mm PVC. The modesty panel will mount between the two pedestals under the worksurface using 1/4-20 joint connector bolts and 1/4-20 joint connector nuts and a steel angle bracket. 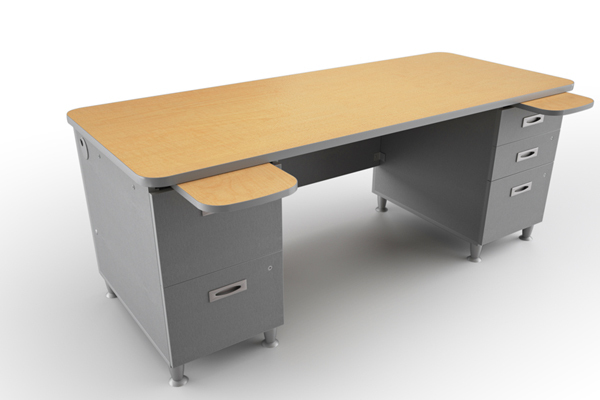 The Single Pedestal desk shall be specifically designed to withstand the structural stress of frequent movement and reconfiguration and shall also be designed to seamlessly accommodate a number of add-on options – including power/data modules, center drawers, and modesty panel or wire manager. There shall be an assembled pedestal mounted underneath the worksurface on either the left or right side. The Single Pedestal desk shall be designed to be combined with the system’s other interchangeable shapes and sizes for flexible configurations. Worksurface – The worksurface of the teacher conference desk shall be constructed of 1 1-8”” thick, high-density particleboard with HPL laminate on the top and a standard backer on the underside. The edging shall be 2mm contour banded PVC. There shall be 5/16-18x22mm metal inserts in the underside of the work surface that shall be used to anchor each leg. For arc and S legs, there shall be a total of five inserts for each leg, spaced and located to maximize anchoring strength and structural support – with the 2 inserts closest to the corner edge of the table being paired and located in such a way that the table and legs can withstand more than 250 lbs of diagonal impact force. For pedestal legs, there shall be two inserts per leg with additional leg support provided by a 30mm x 70mm x 14 ga tubular steel horizontal support/worksurface support bar that shall be anchored to each leg and to the underside of the worksurface. For all tables over 54″ wide that are equipped with either of the arc legs or the S leg there shall be a 48” long, 1” x 1” x 3” x 1” x 1″, 14 gauge, powder coated hat channel brace that shall be securely anchored to the underside of the worksurface in 12 locations to prevent the worksurface from sagging. Pedestal – The pedestal shall mount under the worksurface on either the left or right side using 5/16-18 joint connector bolts into 5/16-18 inserts embedded into the bottom side of the worksurface. The pedestal will be constructed of ¾” high-density particleboard, laminated 2 sides with low pressure laminate. The edging shall be 2mm PVC. 1/4-20 joint connector bolts and 1/4-20 steel cross dowels will be used to construct the pedestal panel parts. The pedestal will have the options to include large file drawers or small pencil drawers. Other options will be open shelves and a door on the opposite side of the drawers. Pedestal would include adjustable aluminum feet or 3” locking casters, mounted in a through-bolt fashion to the base of the cabinet. Legs – The teacher conference desk shall be designed to use either: 1) the S-Leg; 2) the Fixed Arc leg; or, 3) the Pedestal Leg. 1) S Leg – The S leg shall be constructed of 1 1/2″, 14 gauge, powder-coated, steel tubing, bent in two radii. Each leg shall rest on a non-adjustable, stainless steel glide or shall be equipped with one optional 3″, 100 lb locking caster. Each leg section shall be full 360 degree perimeter tungsten arc welded to an extra thick, extra-strength, 6″ x 6″ x 3/16″ steel anchoring plate. There shall be 5 attachment holes in each plate, each specifically spaced to prevent the leg from being installed in the wrong orientation. Each attachment hole shall accommodate a 5/16 x 18 x 5/8 machine bolt that shall anchor into a 1/4 x 20 x .78″ deep threaded metal insert which shall be permanently imbedded at each corner of the worksurface to provide maximum resistance to breakout under abusive impact conditions. 2) Fixed Height Arc Leg – The Fixed Arc leg shall be constructed of 1 1/2″, 14 gauge, powder-coated, steel tubing, formed at the top section into an arc with a radius of 23″. Each leg shall rest on either a non-adjustable, stainless steel glide (3 per table), or an adjustable, stainless steel glide (1 per table) which shall be used to level the table on uneven floors. Additionally, there shall be four optional 3″, 100 lb locking caster available in place of the glides. Each leg section shall be full 360 degree perimeter tungsten arc welded to an extra thick, extra-strength, 6″ x 6″ x 3/16″ steel anchoring plate. There shall be 5 attachment holes in each plate, each specifically spaced to prevent the leg from being installed in the wrong orientation. Each attachment hole shall accommodate a 5/16 x 18 x 5/8 machine bolt that shall anchor into a 5/16-18x22mm deep threaded metal insert which shall be permanently imbedded at each corner of the work surface to provide maximum resistance to breakout under abusive impact conditions. 3) Pedestal Leg – Each adjustable height pedestal leg shall consist of an Upper Leg section, a Lower Leg section and a plastic separating bushing. The Upper Leg section shall be constructed of a powder coated assembly of two 14 gage electric welded oval steel tubes – a horizontal top support tube and an outer vertical column. The horizontal top support section shall measure 30mm x 70mm and the outer vertical column shall measure 40mm x 80mm. The Upper Leg section shall incorporate an extra strength, hidden tubular interlock design located at the point where the upper horizontal top support and outer vertical column are joined. This hidden interlock results from the upper end of the outer vertical column passing through an identically matched oval cutout in the underside of the upper horizontal top support, such that the outer vertical column rests tightly against the upper inside tube surface of the upper horizontal top support. The outer vertical column shall then be metal inert gas (MIG) arc welded to the upper horizontal top support by means of a continuous 360 degree weld around the full perimeter of the 40mm x 80mm outer vertical column. The horizontal top support tube shall have two attachment holes drilled through for the purpose of attaching the work surface. Each attachment hole shall accommodate a 5/16-18 machine bolt that shall anchor into a 5/16-18x22mm deep threaded metal insert which shall be permanently imbedded in the underside of the work surface to provide maximum resistance to breakout under abusive impact conditions. The outer vertical column shall be drilled in two locations to accommodate a ¼-20 height adjustment anchor screw. The Lower Leg section shall be constructed of a powder coated assembly of two 14 gage electric welded oval steel tubes – a lower horizontal floor runner and an inner vertical column. The lower horizontal floor runner shall measure 40mm x 80mm and the inner vertical column shall measure 30mm x 70mm. The Lower Leg section shall incorporate an extra strength, hidden tubular interlock design located at the point where the lower horizontal floor runner and inner vertical column are joined. This hidden interlock results from the lower end of the inner vertical column passing through an identically matched oval cutout in the top of the lower horizontal floor runner, such that the inner vertical column rests tightly against the lower inside tube surface of the lower horizontal floor runner. The inner vertical column shall then be metal inert gas (MIG) arc welded to the lower horizontal floor runner by means of a continuous 360 degree weld around the full perimeter of the 30mm x 70mm inner vertical column. The lower horizontal floor runner shall be drilled and tapped at 6 different 1” increments and shall rest on two non-adjustable, stainless steel glide or two optional 3”, 100 lb capacity, double-locking casters. Both ends of the horizontal top support tube and the lower horizontal floor runner shall be fitted with large, soft-edged, ABS plastic end caps that are sleeve-ribbed to ensure a snug fit. Each end cap shall also include a hidden anchor system to protect against accidental or unauthorized removal. This protection shall be accomplished by means of a latching element molded into the end cap, which, as it is installed, shall enlarge and capture the threaded stem of the glide or caster, or of the work surface anchoring bolt, securing the end cap in place. Horizontal Support/Worksurface Support Bar: To provide for maximum support for each leg, the right and left pedestal leg shall be anchored to an oval 40mm x 80mm x 14 ga steel tube horizontal support bar that shall span the distance between the two legs. The support bar shall be securely anchored to each leg by means of two 5/16-18 screws. The 5/16-18 screws shall be threaded into metal press nuts on the 11 ga steel brackets that are welded to each leg. This support bar shall also be designed provide additional support to the worksurface and shall be welded to the middle of the support bar and anchored into the underside of the worksurface by means of a 5/16-18 screw into a threaded metal insert in the underside of the worksurface. Optional Modesty Panel/Wire Manager – The steel Modesty Panel/Wire manager shall measure 40″ long x 11″ high, and shall be made from 16ga powder coated steel. It shall be anchored to the worksurface using 5/16-18x22mm bolts and 5/16-18mm steel inserts and shall be stiffened with 16 gauge powder coated steel straps. Workstations shall be designed by using a starter/adder concept. A stand alone (starter) or connected (adder) workstation will incorporate a common side panel. This common side panel shall either form the end of one workstation (starter) or serve as the common side panel for an adjoining workstation (adder). The common side panel shall be easily convertible from one to the other if it is necessary to reconfigure the workstations from stand alone to connected, or vice versa, using only the standard hardware for the stand alone workstation. Overall Dimensions –30″ deep; width sized per requirement in 1” increments. Worksurface – Worksurface shall either have a straight front profile or shall be designed to accommodate more effective conferencing and collaborative work by gradually sloping outward from each end, creating a wave profile shape. When joined, work surfaces shall combine both continuous tops with a separation between workspaces. 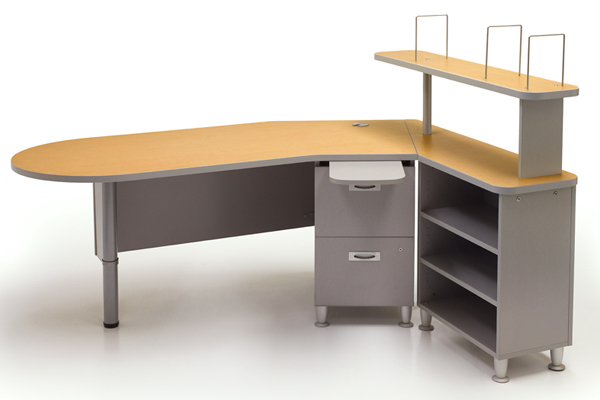 In a standard configuration, this separation is characterized by joining two full-width surfaces with a shared front edge depth of 9”; the remainder of the surfaces are separated by side panels that rise 1/2″ above the work surface providing minimal, but clear separation between work stations when they are connected. These side panels are also available with an 8” or 18” rise above the work surface joined to an equal height back. When these raised sides and backs are used, the shared front edge depth of nine inches is omitted as the design intent is to build full privacy separation between work surfaces. Access point: There shall be a 1.5″ deep rounded access point at the rear of the work surface to allow separate power and data cables to pass through from the work surface to the wire management cavity. Fabrication: Work surface shall be laminated with high-pressure laminate bonded to 1 1/8″ high-density particleboard. The bottom surface shall be laminated with a backer sheet as a moisture barrier. Edging: Work surface shall be contour edge banded with 2mm PVC. Anchoring: The work surface shall be anchored to each side panel using an 18″ x 4″, 12-gauge steel angle brackets. The angle brackets shall be fastened to the side panels using joint connector through bolts for an extra strong connection. The work surface shall be anchored to the back panel using 12-gauge steel angle brackets. All brackets shall be bolted to threaded inserts anchored into the underside of the work surface creating a metal-to-metal connection. Wire Management – Wire management cavity shall be located underneath the rear 8.75″ of the workstation. Cavity Size: Wire management cavity shall be large enough to accommodate a large volume of power and data cables. It shall be 8.75″ from front to back and 10.5″ deep and shall run the width of the workstation. Wire Management Cavity Bottom: Wire management cavity bottom shall consist of two sliding, by-pass doors fabricated from 1/4″ hardboard, smooth on two sides. The by-pass doors will ride one over the other, in slots located on both the back panel and the modesty panel. The wire management cavity bottom panels shall be angle-cut at each corner to allow data and power cables to pass through. Optional Cut-Out for MiniPort – In each worksurface there shall be an optional cutout designed to house a data/electric plug in device/port. Modesty Panel – Modesty panel height shall be 11″. Length: The length of a modesty panel shall equal the distance between the two side panels. Positioning and Anchoring: Modesty panels shall provide additional horizontal structural support for the main work surface section. Modesty panels shall be anchored to the inside of each side panel using shoulder screws and cams. Fabrication: Modesty panels shall be fabricated of 3/4″ thick high-density particleboard covered with smooth finish laminate on both sides. Back Panel – Back panel height shall be 16″. Fabrication: Back panel shall be fabricated of 1″ thick high-density particleboard covered with a smooth finish laminate on both sides. Edging: The top edge of the back panel shall be edge banded with 2mm PVC. Optional Raised/Privacy Back Panels: Each workstation shall be designed to utilize optional raised back panels extending from the floor to either 36” (8″ above the work surface) or 46″ (18″ inches above the work surface). Side Panels – Workstation shall use universal side panels that shall be capable of serving as either the end of one workstation or as the common side panel connecting two connected workstations. Side panel shall be 16″ deep at the floor to allow for minimal foot interference at the bottom of the panel, arching out to 20″ as it reaches the top of the work surface to allow for increased work surface support. Side panel shall rise 1/2″ higher than the work surface to provide minimal, but clear separation between workstations when they are connected. The upper back part of the side panel shall form the inside of the wire management cavity and shall include a 2.5″ diameter central power/data cable pass-through hole which shall be covered with a press-fit grommet. The bottom of each side panel shall be anchored to a 40mm x 80mm powder-coated, 14-gauge steel foot tube using two screw/steel cross dowel connectors for extra strength. Each foot tube shall be equipped with two threaded, adjustable glides. Additionally, both ends of each foot tube shall be fitted with large, soft-edged, plastic end caps that are sleeve-ribbed to ensure a snug fit. Each end cap shall also include a hidden anchor system to protect against accidental or unauthorized removal. This protection shall be accomplished by means of a latching element molded into the end cap which, as it is installed, shall enlarge and capture the threaded stem of the glide. Fabrication: Side panels shall be fabricated of 1″ thick high-density particleboard covered with smooth finish laminate on both sides. Edging: All exposed side panel edges shall be contour edge banded with 2mm PVC. Optional Privacy Side Panels – For each workstation that uses a 46″ privacy back panel, an optional raised side panel shall also be available. Each privacy side panel shall be either 8” or 18″ high at the back and slope downward in an elliptical arc towards the front of the workstation to a height of 10″. Each privacy side panel shall be anchored to the back panel using a joint connector bolt/nut combination that passes through the panel and captures a steel angle bracket that is also anchored to the back panel in a similar fashion. Workstation Component Connections – All connections between individual workstation components shall be made with machined, metal-to-metal hardware in order to effectively accommodate possible multiple assembly and disassembly of workstations over time. The Straight Profile Table shall be specifically designed to allow for maximum flexibility in designing and reconfiguring different current and future configurations and shall be structurally designed to withstand frequent movement and reconfiguration. It shall be designed to be combined with the system’s other interchangeable shapes and sizes for flexible configurations and shall be specifically designed to be “docked” together with all other workstations in the system. Work Surface – The work surface shall be constructed of 1-1/8”” thick, high-density particleboard with HPL laminate on the top and a standard backer on the underside. The edging shall be 2mm contour banded PVC. There shall be 5/16-18x22mm metal inserts in the underside of the work surface that shall be used to anchor each leg. For either of the arc legs there shall be a total of five inserts for each leg, spaced and located to maximize anchoring strength and structural support – with the 2 inserts closest to the corner edge of the table being paired and located in such a way that the table and legs can withstand more than 250 lbs of diagonal impact force. For pedestal legs, there shall be two inserts per leg with additional leg support provided by a 40mm x 80mm x 14 ga tubular steel horizontal support/worksurface support bar that shall be anchored to each leg and to the underside of the worksurface. For all tables over 54″ wide that are equipped with either of the arc legs or the S leg there shall be a 48” long, 1” x 1” x 3” x 1” x 1″, 14 gauge, powder coated hat channel brace that shall be securely anchored to the underside of the worksurface in 12 locations to prevent the worksurface from sagging. Legs – The table shall be designed to use any one of the following legs: 1) the adjustable height arc leg; 2) the fixed height arc leg; or, 3) the adjustable height pedestal leg. 1) Adjustable Height Arc Leg – The adjustable height leg shall consist of an Upper Leg section, a Lower Leg section and a plastic separating bushing. The Upper Leg section shall be constructed of heavy 14 gauge, 1 1/2″ diameter, powder coated steel tubing formed at the top section into an arc with a radius of 23″. The Upper leg shall be formed so that it curves down from its mounted position such that it lines up with the outside edge of the worksurface corner to provide maximum student leg space. The Upper Leg section shall be drilled to accommodate a 1/4-20 height adjustment anchor screw. Each Upper Leg section shall be full 360 degree perimeter tungsten arc welded to an extra thick, extra-strength, 6″ x 6″ x 3/16″ steel anchoring plate. There shall be 5 attachment holes in each plate, each specifically spaced to prevent the leg from being installed in the wrong orientation. Each attachment hole shall accommodate a 5/16 x 18 x 5/8 machine bolt that shall anchor into a 5/16-18x22mm deep threaded metal insert which shall be permanently imbedded at each corner of the worksurface to provide maximum resistance to breakout under abusive impact conditions. Table top heights shall be adjustable in 1″ increments from 22″ up to 31″ by means of the Lower Leg sliding inside of the Upper Leg. The Lower Leg shall be protected with a 9″ long ABS plastic bushing which shall separate the two tube leg sections while at the same time allowing them to smoothly slide up and down – without scratching the outside of the Lower Leg – for easy height adjustment with a single 1/4-20 threaded machine screw. 3) Adjustable Height Pedestal Leg – Each adjustable height pedestal leg shall consist of an Upper Leg section, a Lower Leg section and a plastic separating bushing. The Upper Leg section shall be constructed of a powder coated assembly of two 14 gage electric welded oval steel tubes – a horizontal top support tube and an outer vertical column. The horizontal top support section shall measure 30mm x 70mm and the outer vertical column shall measure 40mm x 80mm. The Upper Leg section shall incorporate an extra strength, hidden tubular interlock design located at the point where the upper horizontal top support and outer vertical column are joined. This hidden interlock results from the upper end of the outer vertical column passing through an identically matched oval cutout in the underside of the upper horizontal top support, such that the outer vertical column rests tightly against the upper inside tube surface of the upper horizontal top support. The outer vertical column shall then be tungsten arc welded to the upper horizontal top support by means of a continuous 360 degree weld around the full perimeter of the 40mm x 80mm outer vertical column. The horizontal top support tube shall have two attachment holes drilled through for the purpose of attaching the work surface. Each attachment hole shall accommodate a 5/16-18 machine bolt that shall anchor into a 5/16-18x22mm deep threaded metal insert which shall be permanently imbedded in the underside of the work surface to provide maximum resistance to breakout under abusive impact conditions. The outer vertical column shall be drilled to accommodate two ¼-20 height adjustment anchor screws. The Lower Leg section shall be constructed of a powder coated assembly of two 14 gage electric welded oval steel tubes – a lower horizontal floor runner and an inner vertical column. The lower horizontal floor runner shall measure 40mm x 80mm and the inner vertical column shall measure 30mm x 70mm. The Lower Leg section shall incorporate an extra strength, hidden tubular interlock design located at the point where the lower horizontal floor runner and inner vertical column are joined. This hidden interlock results from the lower end of the inner vertical column passing through an identically matched oval cutout in the top of the lower horizontal floor runner, such that the inner vertical column rests tightly against the lower inside tube surface of the lower horizontal floor runner. The inner vertical column shall then be tungsten arc welded to the lower horizontal floor runner by means of a continuous 360 degree weld around the full perimeter of the 30mm x 70mm inner vertical column. The lower horizontal floor runner shall be drilled and tapped at 9 different 1” increments and shall rest on two non-adjustable, stainless steel glide or two optional 3”, 100 lb locking casters. Both ends of the horizontal top support tube and the lower horizontal floor runner shall be fitted with large, soft-edged, plastic end caps that are sleeve-ribbed to ensure a snug fit. Each end cap shall also include a hidden anchor system to protect against accidental or unauthorized removal. This protection shall be accomplished by means of a latching element molded into the end cap, which, as it is installed, shall enlarge and capture the threaded stem of the glide or caster, or of the work surface anchoring bolt, securing the end cap in place. Table top heights shall be adjustable in 1″ increments from 24″ up to 32″ by means of the Lower Leg sliding inside of the Upper Leg. The Lower Leg shall be protected with a 11″ long ABS plastic bushing which shall separate the two tube leg sections while at the same time allowing them to smoothly slide up and down – without scratching the outside of the Lower Leg – for easy height adjustment with a single 1/4-20 threaded machine screw. Horizontal Support/Worksurface Support Bar: To provide for maximum support for each leg, the right and left pedestal leg shall be anchored to an oval 30mm x 70mm x 14 ga steel tube horizontal support bar that shall span the distance between the two legs. The support bar shall be securely anchored to each leg by means of two 5/16-18 screws. The 5/16-18 screws shall be threaded into metal press nuts on the 11 ga steel brackets that are welded to each leg. This support bar shall also be designed provide additional support to the worksurface and shall be welded to the middle of the support bar and anchored into the underside of the worksurface by means of a 5/16-18 screw into a threaded metal insert in the underside of the worksurface. 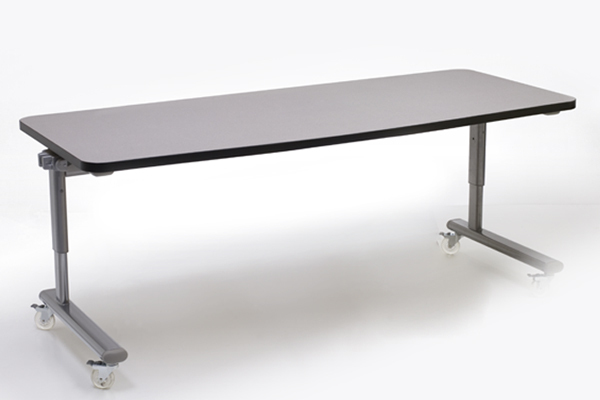 Optional Latching Capability – The table shall be equipped with a large, 5″ x 2″, self-aligning, extra-strength docking connection system to accommodate the easy connection and disconnection of the table to other tables equipped with the docking connection system. The docking connection system shall be “teacher-friendly” and allow for instant connection and disconnection without tools and without removing any parts or hardware. Construction and Operation: The docking connection system shall be self-aligning and shall consist of two mating halves – made of heavy-duty Nylon for maximum ease of connection and longevity – which allow for easy alignment and that result in the tables being snuggly adjacent when connected. The docking connection system shall also consist of a sliding, spring-controlled, latch mechanism that automatically connects the tables when they are pushed together, and easily disconnects the tables when the button-head portion of the latch is pushed forward from the front underside of the station. The button on the sliding latch shall be equipped with a locking screw to discourage unauthorized disconnection. Provision for uneven floors: The docking connection system shall provide equally strong docking when there is vertical misalignment between the tables caused by floor unevenness – up to a plus-or-minus 5/16″ of misalignment. Anchoring: The docking connection system shall be anchored using through-bolt and metal-to-metal connecting hardware. Forced Separation: When the tables are under extreme force, docking connection system shall automatically disconnect with no damage to table or latch if docked tables are pulled apart without releasing latch mechanism. The Straight and Wave Profile workstation shall be designed to allow for maximum flexibility in designing and reconfiguring different current and future classroom configurations and shall be specifically designed to be “docked” together with all other workstations in the system. Shape: The Worksurface shall either have a straight front profile or shall be designed to accommodate more effective conferencing and collaborative work by gradually sloping outward from each end, creating a wave profile shape. Width: The worksurface shall be available in 24”, 30”, 36”, 48”, 60” and 72” widths measured at its widest point. Depth: There are two worksurface depths available. One worksurface shall be 30″ deep at its deepest, center point. The other worksurface shall be 24″ deep at its deepest, center point. Height: Worksurface height shall be adjustable from 22” to 32”,” measuring from floor to worksurface top. Cable Access: The rear of the 30″ deep worksurface shall have two separate 1″ deep x 6” long rounded access points. The rear of the 24″ deep worksurface shall have one 3/4″ deep rounded access point to allow power and data cables to pass through from the worksurface to the underside of the workstation when the workstation is placed against a wall. An optional data/electric Miniport cut-out in the worksurface shall be available. Fabrication: Worksurface shall be laminated with high-pressure laminate bonded to 1 1/8″ high density particleboard. The bottom surface shall be laminated with a backer sheet as a moisture barrier. Edging: Worksurface edges shall be 2mm PVC contour edge band. Anchoring: The worksurface anchoring system shall be strong enough to support frequent lifting or rolling of the station for rearrangement and reconfiguration. Worksurface shall be anchored to the top of each leg by an extra-strength tightening and fastening system. The fastening system shall consist of two 5/16-18x22mm metal inserts installed in the worksurface and two 60mm joint connector bolts screwed in a through-bolt fashion through the leg and into the inserts. Modesty Panel – The modesty panel height shall be 11.5″ high and vary in widths depending on worksurface size. Positioning and Anchoring: Modesty panel shall provide additional lateral structural support for the main worksurface section. Modesty panel shall be anchored to the inside of each leg in a through-bolt fashion for extra strength and extra support, using two steel 60mm joint connector bolts passing through the leg and into two steel cross dowels installed in the modesty panel. Cable Access: Modesty panel shall have two 2.5” diameter cable access holes in for power/data cables to pass through to the back of the workstation. Cable access holes shall be located within 3” of each outside leg and within 3” of the top of the modesty panel. Fabrication: Modesty panel shall be fabricated of 3/4″ thick high-density particleboard covered with smooth finish laminate on both sides. Leg Characteristics – Each workstation shall have 2 adjustable height pedestal legs. Each adjustable height pedestal leg shall consist of an Upper Leg section, a Lower Leg section and a plastic separating bushing. The Upper Leg section shall be constructed of a powder coated assembly of two 14 gage electric welded oval steel tubes – a horizontal top support tube and an outer vertical column. The horizontal top support section shall measure 30mm x 70mm and the outer vertical column shall measure 40mm x 80mm. The Upper Leg section shall incorporate an extra strength, hidden tubular interlock design located at the point where the upper horizontal top support and outer vertical column are joined. This hidden interlock results from the upper end of the outer vertical column passing through an identically matched oval cutout in the underside of the upper horizontal top support, such that the outer vertical column rests tightly against the upper inside tube surface of the upper horizontal top support. The outer vertical column shall then be metal inert gas (MIG) arc welded to the upper horizontal top support by means of a continuous 360 degree weld around the full perimeter of the 40mm x 80mm outer vertical column. The horizontal top support tube shall have two attachment holes drilled through for the purpose of attaching the work surface. Each attachment hole shall accommodate a 5/16-18 machine bolt that shall anchor into a 5/16-18x22mm deep threaded metal insert which shall be permanently imbedded in the underside of the work surface to provide maximum resistance to breakout under abusive impact conditions. The outer vertical column shall be drilled in two locations to accommodate a ¼-20 height adjustment anchor screw. Table top heights shall be adjustable in 1″ increments from 22″ up to 32″ by means of the Lower Leg sliding inside of the Upper Leg. The Lower Leg shall be protected with a 11″ long ABS plastic bushing which shall separate the two tube leg sections while at the same time allowing them to smoothly slide up and down – without scratching the outside of the Lower Leg – for easy height adjustment with a single 1/4-20 threaded machine screw. Wire Manager/Raceway (Optional) – Each workstation shall be equipped with a textured, .125” ABS wire manager. The wire manager shall be securely anchored to the back of the modesty panel – using a 1/4-20 x 20mm joint connector bolt and a 1/4-20 x 17mm joint connecter nut. The wire manager shall be anchored to the modesty panel. It shall be positioned 1/2” inside each leg and shall be precisely formed to extend outward and slightly upward for 7.5” and then directly up to the underside of the workstation. The wire manager shall have a natural spring tension to hold it snuggly in place against the underside of the worksurface and shall be precisely positioned to allow for wires and cables to pass through the cable access area in the back of the worksurface into the wire manager. There shall also be two steel, 90 degree clips mounted into the underside of the back edge of the worksurface to provide additional support for the top edge of the wire manager. Docking Connection System (Optional) – Each workstation shall be equipped with a large, 5″ x 2″, self-aligning, extra-strength docking connection system to accommodate the easy connection and disconnection of stations. Docking connector shall be a central feature of all workstations. Docking connection system shall be “teacher-friendly” and allow for instant connection and disconnection of stations without tools and without removing any parts or hardware. Construction and Operation: Docking connection system shall be self-aligning and shall consist of two mating halves – made of heavy-duty Nylon for maximum ease of connection and longevity – which allow for easy station alignment and that result in stations being snuggly adjacent when connected. Docking connection system shall also consist of a sliding, spring-controlled, latch mechanism that automatically connects two stations when they are pushed together, and easily disconnects two stations when the button-head portion of the latch is pushed forward from the front underside of the station. The button on the sliding latch shall be equipped with a locking screw to discourage unauthorized disconnection. Provision for uneven floors: Docking connection system shall provide equally strong docking when there is vertical misalignment between stations caused by floor unevenness – up to a plus-or-minus 5/16″ of misalignment. Anchoring: Docking connection system shall be anchored to each leg 15″ from the front of the worksurface using through-the-leg, metal-to-metal connecting hardware. Forced Separation: When workstations are under extreme force, docking connection system shall automatically disconnect with no damage to stations or latch if docked stations are pulled apart without releasing latch mechanism. Top Surface – The top surface of the teacher conference desk shall be rounded at one end to allow for more effective conferencing and shall be constructed of 1-1/8”” thick, high-density particleboard with HPL laminate on the top and a standard backer on the underside. The edging shall be 2mm contour banded PVC. There shall be 5/16-18x22mm metal inserts in the underside of the work surface that shall be used to anchor each leg. For arc and S legs, there shall be a total of five inserts for each leg, spaced and located to maximize anchoring strength and structural support – with the 2 inserts closest to the corner edge of the table being paired and located in such a way that the table and legs can withstand more than 250 lbs of diagonal impact force. For pedestal legs, there shall be two inserts per leg with additional leg support provided by a 40mm x 80mm x 14 ga tubular steel horizontal support/worksurface support bar that shall be anchored to each leg and to the underside of the worksurface. For all tables over 54″ wide that are equipped with either the arc tube leg or the S tube leg, there shall be a long, 1″ x 1″ rectangular steel support brace that shall be securely anchored to steel inserts in the underside of the worksurface to prevent the worksurface from sagging. 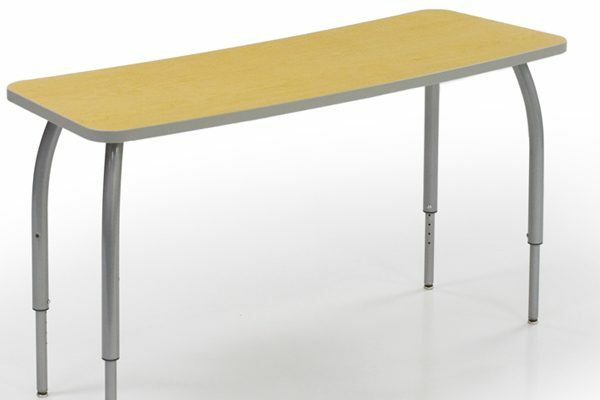 Legs – The teacher conference desk shall be designed to use one of the following legs: 1) the S leg; 2) the Fixed Arc leg; or, 3) the adjustable height pedestal leg. Optional Modesty Panel/Wire Manager – The semi-rigid Modesty Panel/Wire manager shall measure 40″ long x 11″ high, and be constructed of 16ga cold rolled steel with powder coat finish. It shall be anchored to the worksurface using screws and steel inserts and shall be stiffened with 16 gauge powder coated steel straps. The Modesty Panel/Wire Manager shall be roll-formed to curve inward at its lowest point to form a 4″ lip to accommodate power/data cables. 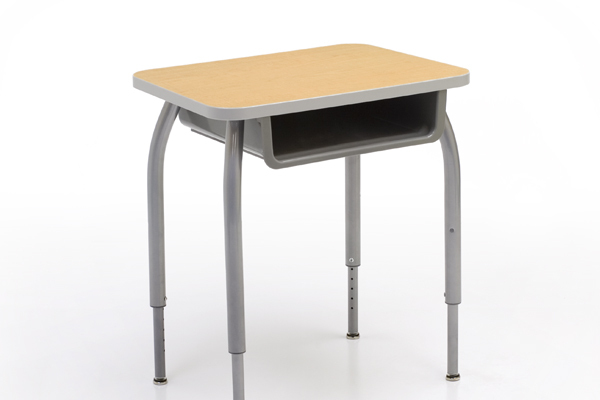 The Latchable Return shall be specifically designed to withstand the structural stress of frequent movement and reconfiguration and shall also be specifically designed to maximize storage capabilities and options for the teacher. It shall be designed to be easily latched/unlatched to and be consistent in look and appearance with the corresponding teacher conference desk. Overall Dimensions – 24″ Deep; 61″ Wide; 29″ High. Base – The base shall also be curved to mirror the top surface and shall be constructed of 1″ thick particleboard, laminated 2 sides with low pressure laminate. The edging shall be 2 mm pvc contour edge banding. There shall be (6) 3″ diameter, locking, plate mounted casters anchored to the bottom with bolts threaded into metal inserts in the base panel. Vertical Support Panels -The two vertical panels that make up the storage cabinets and support the top surface shall be constructed of ¾”high-density particleboard, laminated 2 sides with low pressure laminate. These vertical panels shall be anchored to the top surface using angle brackets through bolted to the side panels and bolted to metal inserts in the top surface. They shall be anchored to the bottom panel using joint connector bolts through the bottom panel into steel cross dowels in the vertical support panels. In addition, both middle vertical support panels shall be anchored to a mid-horizontal panel that shall extend through the middle of the station. The left vertical support panel shall form the outside left wall of the open/drawer storage area and also shall form the back for the front end storage area. The right vertical support panel shall form the right outside wall for the tote storage area. Back – The back panel shall be constructed of ¾”high-density particleboard, laminated 2 sides with low pressure laminate and shall be located behind the main section of the station, leaving open the back of the two outside sections. The back panel shall be designed to provide for additional structural integrity and shall be anchored to the bottom panel using joint connector bolts through the bottom panel into steel cross dowels in the back panel. Additionally, it shall be anchored to the vertical support panels using joint connector/steel cross dowel fasteners. The back panel shall also be designed with wire pass though areas so the return can easily accommodate electrical equipment. Storage – The station shall have multiple optional, mixed-type storage areas. On the left end shall be an adjustable shelf cabinet, with optional locking doors, oriented so that the open side is accessed from the left outside end of the latchable return. To the right of this cabinet shall be an open, fixed shelf that can be accessed from either the front or back of the latchable return. To the right of this there shall be a 14” wide open storage area with a fixed shelf in the middle; the top and bottom halves of the storage area shall be designed to either remain open or accommodate either (1) 12” or (2) 6” drawers. To the right of this area shall be a space designed to accommodate 18″ of clear, plastic totes – mixed and matched from 3″ and 6″ high options. 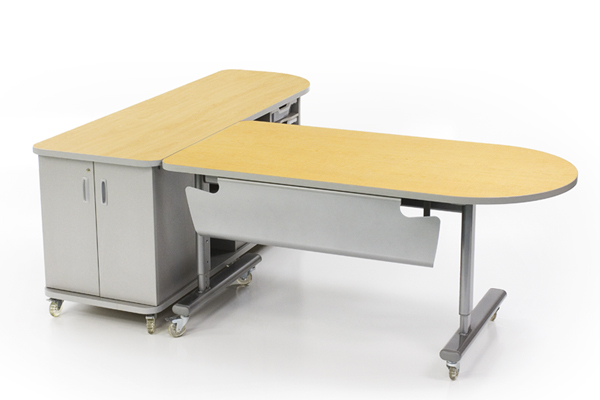 Latch – The latchable return shall be equipped with a large, 5″ x 2″, self-aligning, extra-strength docking connection system to accommodate the easy connection and disconnection of the latchable return to the corresponding teacher conference desk. The docking connection system shall be “teacher-friendly” and allow for instant connection and disconnection without tools and without removing any parts or hardware. Construction and Operation: The docking connection system shall be self-aligning and shall consist of two mating halves – made of heavy-duty Nylon for maximum ease of connection and longevity – which allow for easy alignment and that result in the return and the desk being snuggly adjacent when connected. The docking connection system shall also consist of a sliding, spring-controlled, latch mechanism that automatically connects the return and desk when they are pushed together, and easily disconnects the return and desk when the button-head portion of the latch is pushed forward from the front underside of the station. The button on the sliding latch shall be equipped with a locking screw to discourage unauthorized disconnection. Provision for uneven floors: The docking connection system shall provide equally strong docking when there is vertical misalignment between return and desk caused by floor unevenness – up to a plus-or-minus 5/16″ of misalignment. Forced Separation: When return and desk are under extreme force, docking connection system shall automatically disconnect with no damage to return or desk or latch if docked stations are pulled apart without releasing latch mechanism. 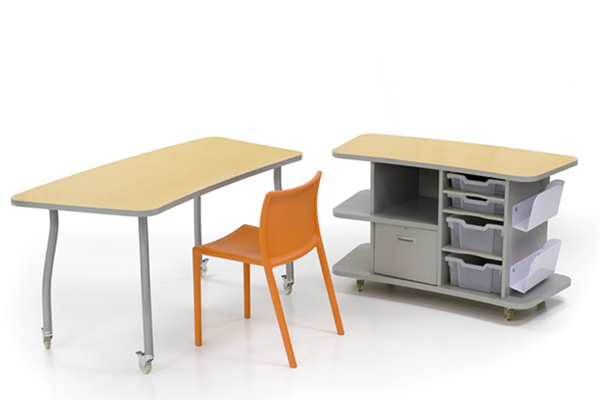 The teacher flux desk shall be specifically designed to withstand the structural stress of frequent movement and reconfiguration and shall also be designed to seamlessly accommodate a number of add-on options – including power/data modules, center drawers, and modesty panel or wire manager. 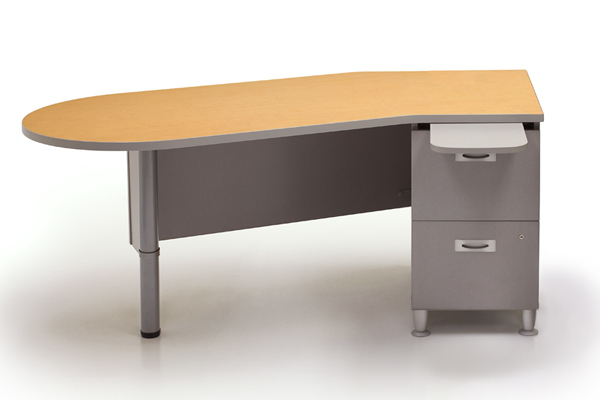 Top Surface – The top surface of the teacher flux desk shall be slightly curved at a 147″ radius to allow for a slight wrap-around feeling and shall be constructed of 1-1/8″ thick, high-density particleboard with HPL laminate on the top and a standard backer on the underside. The edging shall be 2mm contour banded PVC. For Arc legs, there shall be 5/16-18x22mm metal inserts in the underside of the work surface that shall be used to anchor each leg. There shall be a total of five inserts for each Arc leg, spaced and located to maximize anchoring strength and structural support – with the 2 inserts closest to the corner edge of the table being paired and located in such a way that the table and legs can withstand more than 250 lbs of diagonal impact force. For Pedestal Legs, there shall be two inserts per leg with additional leg support provided by a 40mm x 80mm x 14 ga tubular steel horizontal support/worksurface support bar that shall be anchored to each leg and to the underside of the worksurface. For all tables over 54″ wide that are equipped with the Arc leg, there shall be a 48” long, 1” x 1” x 3” x 1” x 1″, 14 gauge, powder coated hat channel brace that shall be securely anchored to the underside of the worksurface in 12 locations to prevent the worksurface from sagging. Legs – The teacher flux desk shall be designed to use one of the following legs: 1) the Fixed Arc leg; or, 2) the Pedestal Leg. 1) Fixed Height Arc Leg – The Fixed Arc leg shall be constructed of 1 1/2″, 14 gauge, powder-coated, steel tubing, formed at the top section into an arc with a radius of 23″. Each leg shall rest on either a non-adjustable, stainless steel glide (3 per table), or an adjustable, stainless steel glide (1 per table) which shall be used to level the table on uneven floors. Additionally, there shall be four optional 3″, 100 lb locking caster available in place of the glides. Each leg section shall be full 360 degree perimeter tungsten arc welded to an extra thick, extra-strength, 6″ x 6″ x 3/16″ steel anchoring plate. There shall be 5 attachment holes in each plate, each specifically spaced to prevent the leg from being installed in the wrong orientation. Each attachment hole shall accommodate a 5/16 x 18 x 5/8 machine bolt that shall anchor into a 5/16-18x22mm deep threaded metal insert which shall be permanently imbedded at each corner of the work surface to provide maximum resistance to breakout under abusive impact conditions. 2) Adjustable Height Pedestal Leg – Each adjustable height pedestal leg shall consist of an Upper Leg section, a Lower Leg section and a plastic separating bushing. The Upper Leg section shall be constructed of a powder coated assembly of two 14 gage electric welded oval steel tubes – a horizontal top support tube and an outer vertical column. The horizontal top support section shall measure 30mm x 70mm and the outer vertical column shall measure 40mm x 80mm. The Upper Leg section shall incorporate an extra strength, hidden tubular interlock design located at the point where the upper horizontal top support and outer vertical column are joined. This hidden interlock results from the upper end of the outer vertical column passing through an identically matched oval cutout in the underside of the upper horizontal top support, such that the outer vertical column rests tightly against the upper inside tube surface of the upper horizontal top support. The outer vertical column shall then be tungsten arc welded to the upper horizontal top support by means of a continuous 360 degree weld around the full perimeter of the 40mm x 80mm outer vertical column. The horizontal top support tube shall have two attachment holes drilled through for the purpose of attaching the work surface. Each attachment hole shall accommodate a 5/16-18 machine bolt that shall anchor into a 5/16-18x22mm deep threaded metal insert which shall be permanently imbedded in the underside of the work surface to provide maximum resistance to breakout under abusive impact conditions. The outer vertical column shall be drilled to accommodate two ¼-20 height adjustment anchor screws. Shape: The left end shall be a semi-circle and the front-edge (closest to user) shall extend 29” from the point where circle ends to a point where the edge turns at a 26 degree angle to extend another 16” to the right corner, then back at 90 degrees to the right rear corner. The resultant shape (which is 72.5” from tip to tip is approximately 13.5 square feet and shall “wrap around” the user slightly. Depth: Worksurface shall be 30″ deep from front to back. Width: Worksurface shall be 72.5” wide from tip to tip. Height: Worksurface height shall be 29”, measuring from floor to worksurface top. Fabrication: Worksurface shall be laminated with high pressure laminate bonded to 1-1/8” high density particleboard. Edging: Worksurface edges shall be contour banded with 2mm pvc edging bonded to the worksurface. Support: Worksurface shall be supported by a single 60mm diameter round steel leg tube with adjustable glide on the left (located at the centerpoint of the circle), fastened to the worksurface by a 2mm thick steel plate and four 22mm bolts screwed into steel inserts; the right support shall be provided by the drawer/equipment pedestal. Pedestal Base – Pedestal Base shall consist of two sections in order to provide file and/or equipment storage in the front and wire-management in the back. The pedestal shall be able to be used with either right-hand or left-hand worksurface orientation. Height: Pedestal Base shall measure 28” high (outside dimension). Width: Pedestal Base shall measure a total of 16” wide (outside dimension). Depth: Pedestal Base shall measure 28” from front to back. Fabrication: Pedestal Base shall be constructed of ¾” solid core, with plastic laminate on both sides and 2mm pvc edge band. Support: The pedestal shall rest of 4 adjustable height, cast aluminum glides. The glides shall be 2 ½” in diameter and shall be mounted by through-bolting into the base panel of the pedestal. Front Storage Area: Front storage area shall measure 14 ½” wide x 20” deep x 23 ½” high (all inside dimensions) with a series of holes on 32mm centers on the side panels such that a combination of shelves and drawers shall be accommodated. The standard arrangement shall be a 12 ½”high file drawer on the bottom and a 5” box and a 5” open shelf area above. The inside dimension of the file drawer shall be 19” deep x 13” wide. The box drawer shall be 15” deep x 13” wide. The pencil drawer shall be 2” high inside and the file drawer shall be 6 ” high inside; 16” steel tubes run from to back in the file drawer such that either letter size hanging folders can be accommodated. Both file and box drawers shall be fitted with locks. Wire-Management Area: The inside dimensions of the back section shall measure 6” front to back, 14 ½” side to side and 23 ½” high, and shall provide storage for power and other cords and wires. A full sized hinged door shall provide access. A ¾” thick baffle separates the front from the back sections, with a 2 ½” diameter hole between each of the three front housings and the back section for cord passage and air circulation. A 6-outlet power strip with surge protection shall be mounted inside the top of the housing such that equipment cords can be passed through a 2 ½” grommet hole directly over the rear edge of the pedestal. Wire Access: On each side of the pedestal shall be located two 2 ½” diameter round holes into which are inserted grommets with covers for cords and wires: one shall be positioned 4” from the back edge and 2 ¼” from the top, and the other shall be positioned 2” from the back edge and 2” from the bottom. Optional CPU Holders: Each side of the pedestal shall be equipped with fittings to hold to 3” by 16” metal CPU brackets with adjustable straps which in turn will vertically mount different size CPU housings. Modesty Panel – Modesty panel shall extend from the left-hand leg to the left side of the pedestal and shall provide a “housing area” for a CPU tower. Modesty panel shall be constructed of ¾” solid care, with plastic laminate on both sides and 2mm pvc edge band and shall extend 12” below the bottom of the worksurface. Optional Extension – An optional extension shall be available and shall consist of a worksurface “return” and an upper bookshelf and lower shelf system for additional storage of papers, books and equipment. Extension shall be fabricated of the same material as the main station. Shape and location: Extension worksurface shall be positioned so as to provide a right-angle return from the main work surface’s primary front edge. The angle between the pedestal base and the extension shall be 116 degrees. Width: Extension worksurface shall be 13” wide. Depth: Extension worksurface shall be 49” tip to tip. Width: Lower shelf system shall be 23” wide. Depth: Lower shelf system shall be 12 ¼” deep. Internal dimensions: Interior of lower shelf system area shall be 23 ½” high by 11” deep by 21 ½” wide. Interior of side panels shall be drilled with holes at 32mm centers to accommodate storage shelves. Wire access: Each end panel of lower shelf system shall have a 2 ½ ” diameter round hole, positioned 1 ¼” from the back and 1” from the top, into which is inserted a grommet with cover for cords and wires. Width: Upper bookshelf shall be 47.5” tip to tip. Depth: Upper bookshelf shall be 9” deep. Support: Upper bookshelf shall be supported on one 38mm diamter round steel tube and a ¾” solid core slab end, 12” above the extension worksurface. Bookends: Eight painted wire bookends, 6 ¼” wide and 6” high shall be spaced at 10 ½” centers along the length of the upper bookshelf, such that they can be positioned across or with the shelf length. Technical Specifications Fully dismountable armchair with separate elements. Seat Inner structure in tubular steel 25x25x2, with Pirelli rubber and polypropylene webbing. Seat padding in self-extinguishing polyurethane, cold-foamed, without CFC, complying with UNI 9175, minimum polyurethane density 55 kg/m3, attached to the plywood structure with water based resins glue. Fabric upholstery adheres to the padding without use of glue and is sealed by a zipper. Backrest inner structure in 13 mm beech ply-wood with side supports in 5 mm thick steel plate.Backrest padding in self-extinguishing contoured polyurethane foam, average thickness of 65 mm and density 40 kg/m3, attached to the plywood structure with water based resins glue. Fabric upholstery adheres to the padding without use of glue. Lower back protector in 1mm thick steel plate. Side leg in 4mm structural steel with padded side panels; kick plate in 3mm steelplate; side panels in 8mm thick fir chipboard. Side padding in self-extinguishing contoured polyurethane foam, attached to the side panel by water based resins glue. Front and back padding in self-extinguishing contoured polyurethane foam, 65 kg/m3 density attached to the side panel by water based resins glue. Arm caps: Option 1: padded and upholstered; Option 2: natural varnished solid beechwood Option 3: polyurethane. Seat mechanism: The flip-up mechanism of the seat works by gravity. The floor fixing bracket is in steel 4 mm. thick. The kick plate is in grey varnished steel plate or in varnished solid beechwood. All visible metal parts are in grey color, painted with epoxy scratch-resistant powders. The armchair has the Italian Class 1IM Certificate for flame retardancy from the Italian Ministry of the Interior. WRITING TABLET Genesis Evolution can be equipped with a flip up writing tablet inside the armrest, in High Pressure Laminated (HPL), overall dimensions (226 x 310 x 8 mm), with rounded edges, black colour; the anti-panic mechanism of the tablet is in steel. As an alternative an antipanic table fixed on the back, scratch-resistant bilaminate wood conglomerate with squared front edge ( no bull nosed) Side and back edges in ABS, 2 mm thick; standard depth 300 mm, standard thickness 30 mm. The table brackets are in 3 mm thick stamped steel. Its movement is obtained by using two stamped steel hinges which are 5 mm. thick and rotate on brass bushes. ACCESSORIES: -Embroidered and row numbering, -Row terminal light. Backrest Inner structure in beech plywood, 15 mm thick; Padding in non-deformable, self extinguishing polyurethane foam with variable density, complying with UNI norm 9175, density of 30 kg Kg/m3, attached to the wood structure by means of adhesive waterbased resins. Upholstery made in fabric not directly glued to the padding. mechanism kit with gas cylinder Side leg fixing plate in laser-cut steel plate, 5 mm thick Side legs connection plate in laser-cut and folded steel plate, 5mm thick; Supports of the backrest mechanism in laser-cut steel plate, pressed and folded, 5mm thick, with self-lubricating bushings. 200 Newton gas cylinder with quick fixing system. Structure in beech plywood, 15 mm thick with side supports in pressed steel plate, 3mm thick, and 15mm steel rod. Padding in non-deformable, self extinguishing polyurethane foam with variable density, complying with UNI norm 9175, density of 40 kg Kg/m3, attached to the wood structure by means of adhesive water-based resins Counterweight in 30x6mm laminated steel. Upholstery made in fabric not directly glued to the padding. leg Structure in 4mm steel plate; kickplate in 10mm thick pressed steel plate with 2 floor fixing points. Side and lower panels in fir chipboard, 8mm thick Side padding in non-deformable, self extinguishing polyurethane foam with variable density, complying with UNI norm 9175, density of 40 kg Kg/m3, attached to the wood structure by means of adhesive water-based resins. Front and back padding in non-deformable, self extinguishing polyurethane foam with variable density, complying with UNI norm 9175, density of 65 kg Kg/m3, attached to the closing panels by means of adhesive water-based resins. Armrest padding in non-deformable, self extinguishing polyurethane foam with variable density, complying with UNI norm 9175, density of 65 kg Kg/m3, attached to the closing panels by means of adhesive water-based resins. Seat rotation mechanism in polypropylene. Seat and row numbering thermo glued or embroidered. Custom colors for the metal structure are available Screws for fixing on a R35 concrete floor Flip-up antipanic writing tablet in the side leg, rounded edges, in black HPL, 8 mm. Supports in steel plate, 2,5 mm thick and steel rod of 12mm. Mobile hinges in brass. Chair: provide and install fixed auditorium seating with uplift seat bottom and optional anti-panic tablet arm per drawing. Dimensions are nominal and based on current product information. General: Submit listed submittals in accordance with Contract and standard Submittals Procedures. Product Data: Submit manufacturers’ product data, including product specification sheets, for products specified. Shop Drawings: Submit shop drawings showing seating layout, seat-numbering scheme, chair sizes and aisle widths. Samples: Submit verification samples of finishes, colors and textures specified for each exposed material. Certificates: Product certificates signed by manufacturer certifying materials comply with specify performance characteristics and criteria and physical requirements. Installer Qualifications: Submit certification indicating installer is qualified to install manufacturer’s seating. Bidder Qualifications: Submit certification, prior to drawing completion, indicating site has been inspected for any conditions that may affect the assembly or installation of products required. Project Warranty: Refer to “Conditions of the Contract” to project warranty provisions. Manufacturer’s standard warranty documents executed by authorized company official. Manufacturer’s warranty is in addition to, and not a limitation of, other rights Owners may have under Contract Documents. Warranty period; Seven (7) year warranty on mechanical and steel structure from defects of manufacture and workmanship, commencing on Date of Substantial Completion. Warranty will be null and void if products are installed on flooring not meeting minimum structural requirements as specified by manufacturer. Seat – Fully upholstered seat with 2.75” average thickness 2.5 lb/cu. ft. HR density self-extinguishing polyurethane foam provides maximum comfort and durability. Gravity uplift seat with counterweight mechanism automatically returns the seat to its vertical position when unoccupied. Optional California Bulletin 133 compliance. Center to center seat sizes in 20.5”, 21.75”, 22.75”, 24.5”, 26.75”. Back – Fully upholstered upper back outer panel. Lower panel also available in polypropylene and wood. Inner panel is made of 0.4” thick birch plywood, upholstered with 2.75” average thickness 1.9 lb/cu. ft. density HR polyurethane foam with double curved ergonomic design for comfort / lumbar support. Back height is available in 36.2”, 38.2” and 44”. Center to center back sizes in 20.5”, 21.75”, 22.75”, 24.5”, 26.75”. Side/Arms – Side panels available with fabric upholstery. Armrest structure is powder coated .160” steel. Armrest available upholstered with .8” thickness 3.75 lb/cu. ft. density foam padding, contoured injection molded ABS, or natural varnished wood. Pedestal Supports – Formed oval steel tubing measuring 3.5” x 1.2” cross section, welded to .100” thick mounting flange. Epoxy powder coat finish. Tablet Arm – Contoured phenolic tablet arm 13.75”wide and 10” deep. Machined swivel joint with mechanism tested to support 500 lbs. The tablet arm opens and stows in one movement for antipanic egress. Options – Power provision, Aisle light with illuminated row letter and seat numbers, embroidered seat numbering, riser mounted standards, removable base, wood seat bottom and back panel. Comply with manufacturer’s installation instructions, including bulletins, product catalog, installation instructions and product carton instructions for installation. Site Verification: Prior to installation verify, with installer present, that substrates and conditions comply with the requirements for construction tolerances and materials properties as they affect anchors and fasteners and location of junction boxes. Repair: Do not proceed until unsatisfactory components or facility conditions have been corrected. Installation: Install following manufacturers printed instructions for installation and using manufacturer recommended hardware and fasteners. Tables in curved rows shall be installed at smooth radius. Repair: Repair minor abrasions and imperfections in painted surfaces with a coating that matches the factory- applied finish. Replace: Replace any fabric damaged during installation. Cleaning: Clean Product in accordance with manufacturer instruction prior to Owner’s acceptance. Remove construction debris, including cartons from project site and legally dispose of debris. Protection: Protect installed product and finished surfaces from damage during construction. Manufacturer’s Fixed Auditorium Seating with Tablet Arm. Extent: Extent of the fixed seating as indicated on drawings and as specified herein including product data sheets. Chair: Deliver and install a fixed seat auditorium seat with gravity uplift seat and optional anti-panic tablet arm in accordance with drawings. Dimensions are nominal and are based on the current product information available. General: Submit listed submittals in accordance with “Conditions of the Contract” and Division 1 Submittals Procedures section. Product Data: Submit manufacturer’s product data, including product specification sheets, for specific products. Samples: Submit selection and verification samples of finishes, colors and textures for each exposed material. Installer Qualifications: Submit certification indicating installer is qualified to install manufacturers seating. Bidder Qualifications: Submit certification, prior to drawing completion, indicating site has been inspected for any conditions that may effect the assembly or installation of products required. Manufactures Warranty; Submit, for Owners acceptance, manufacturers standard warranty documents executed by authorized company official. Manufactures warranty is in addition to, and not a limitation of, other rights Owners may have under Contract Documents. Warranty period; (10) year warranty on understructure and shells from manufacture defect and workmanship, commencing on Date of Substantial Completion. Seat: formed on a high impact injection polypropylene frame with five serpentine springs and polyurethane cold molded anatomic cushion. Gravity self-rising system mounted on an injected high impact polypropylene structure. Pivot connection is a 5/8” round steel axle, with two side wings supports stamped with 7 gauge steel. Two inner supports stamped in 11 gauge steel. The bottom is protected by an injected high impact polypropylene cover which is textured on the outer face. Center to center seat sizes in 19”, 20”, 21”, 22”, 23”. Back: polyurethane cold molded cushioning, with an ergonomically shape attached on an integral base made of high impact injection polypropylene, structured with multi-ribbed on the inner side and textured on its outer side. Featuring with two folded wing brackets made of 14 gauge steel to be attached to the center standards and aisle ends and has a rear back cover made of injected high impact polypropylene which is textured on the outer face. Center to center back sizes in 19”, 20”, 21”, 22”, 23”. Side/Arms: Internal support structure steel plate painted with powder coat in aluminum or anthracite. Side panels available with fabric upholstery, laminate or wood. Armrest in polypropylene, solid wood or upholstered with non-deformable polyurethane foam. Pedestal Supports: center and sides made of rectangular section tube of 1” x 3” 14 gauge. Back support in 14 gauge, seat support in 7 gauge, arm rest support 14 gauge, foot plate to be fixed on floor in 11 gauge steel. FINISH: The metal parts previously degreased and phosphatized, are protected by EPOXICA and micro-sprayed thermoplastic painting, with electrostatic equipment and oven baked up to 200°C. Site Verification: Prior to installation verify, with installer present, that substrates and conditions comply with the requirements for construction tolerances. Repair: Do not proceed until unsatisfactory conditions have been corrected. Installation: Install following manufacturers printed instructions for installation and using manufacturer recommended hardware and fasteners. Chair and tables in curbed rows shall be installed at smooth radius. Adjustments: Adjust seat mechanism to ensure seats in each row are aligned when in the upright position.